This Nor-Tech 5000 SuperCat has undergone NEW Silver metallic painted hullsides and Top deck. Tunnel and running surface has also been painted Black. Motors are disassembled 632ci/ 1200 HP with 14-71 Blower shop superchargers. You can have your engine builder put them together your way! United Yacht Sales New Jersey would love to guide you through a personal showing of this 50' Nor-tech 5000 Supercat 2002. 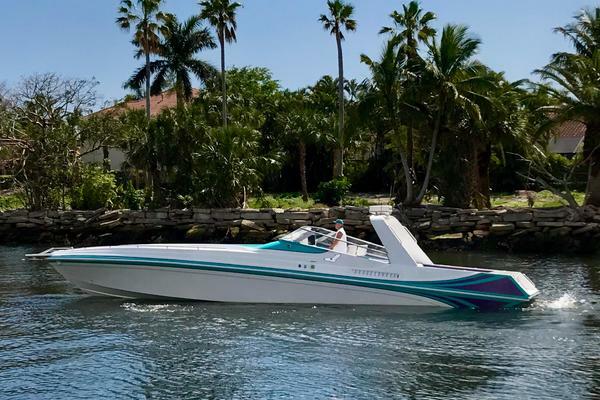 This yacht for sale is located in Pompano Beach, Florida and priced at $198,995. For a showing please contact us by filling out the form on this page and we will get back to you shortly! We’ve mastered the art of buying and selling boats. People do business with people they like and trust. At FB Marine Group, each new listing is the beginning of a new relationship. Our commitment is to exceed your expectations with attentive service, communication and results. Add the use of multi-tiered marketing and this means we sell your boat fast. Since 1994, we have built our success by earning the loyalty of long-lasting clients. That’s what sets us apart from the competition.FB Marine Group is YOUR one-stop source for new, preowned, brokerage boat sales, service, parts and storage. We take trades and offer in house financing. Contact us today!